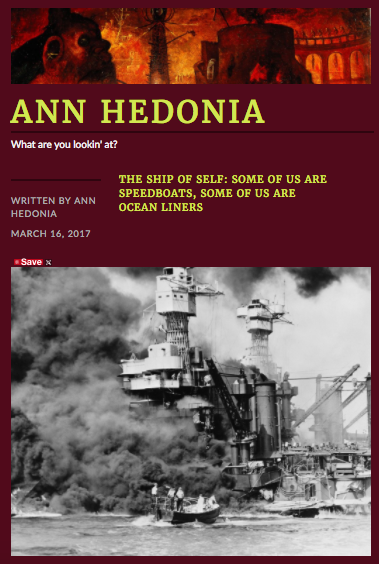 I’ve given birth to a new persona for my sci-fi and horror writing–she’s burst forth from my head like Athena!–and I gave her a super gothy name to go with her own blog: Ann Hedonia. She’s the part of me who befriends the monsters under the bed, and she’s working on a unique sci-fi horror novel in which humanity is the monster: Elektra’s Revenge. In fact, she’s just about done, so if you have any friends who publish sci-fi, tell them the time to move in on this red-hot property is now. Yesterday. Last week. GO! I gave her a brand-new blog, featuring Hieronymous Bosch’s classic depictions of hell. Cheery, eh? Précédent Check out My Fitness Blog!